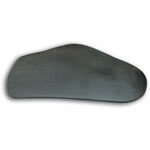 A domed shaped poron pad to lift and spread the metatarsal bones. Used to treat dropped metatarsals, metatarsalgia, interdigital neuroma, hallux valgus, excessive callus. A 3mm poron pad placed under the 1st metatarsal phalangeal joint to the toe. This raises and slightly immobilises the big toe. Often used for hallux rigidus. 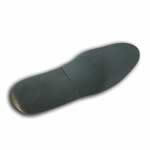 A 1 mm vinyl cover underneath the forefoot of the sulcus or full length orthotics to add rigidity to the topcover. 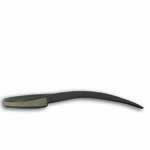 Useful for running or tennis shoes where reinforcement is needed. 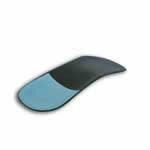 The medial border of the orthotic is extended vertically upwards to stop the foot rolling inwards. 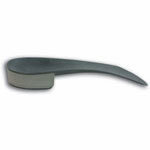 Used for severely pronated feet to stabilise the sub talar and mid tarsal joints. The lateral border of the orthotic is extended vertically upwards. 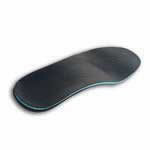 Used for severely supinated/inverted foot types to increase stability and help prevent inversion sprains. A 3 mm thick poron pad covering the entire heel area. 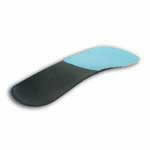 Used for plantar fasciitis to provide additional rearfoot shock absorption. The shell is cut out under the 1st metatarsal phalangeal joint to slightly plantarflex the 1st ray and pronate the forefoot. A horseshoe shaped poron pad in the heel cup area. 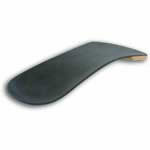 Designed to lift the heel off the orthotic to relieve the pressure of a centrally located spur. 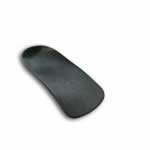 A 10mm poron arch fill on the plantar surface of the orthotic. 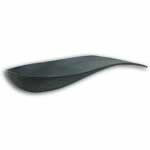 To add rigidity to the orthotic. 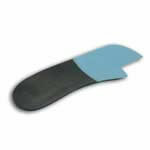 A poron pad placed under 2-5 metatarsal heads to take the pressure off the 1st metatarsal phalangeal joint. 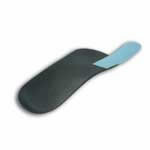 An extrinsic heel lift added to the underside of the orthotic, made from extra-firm posting material. An intrinsic grind 15 deg into the medial side of the positive cast to a depth of 2mm, 4mm or 6 mm to intrinsically correct for over-pronation. Used with an extrinsic rearfoot post and a deep heel cup. An intrinsic grind 15 deg into the lateral side of the positive cast to a depth of 2mm, 4mm or 6 mm to intrinsically correct for excessive supination. Used with an extrinsic rearfoot post and a deep heel cup. 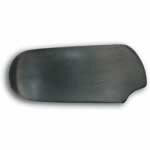 An additional layer of padding between the topcover and the orthotic shell running the full length of the orthotic. 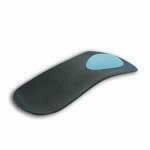 Useful for patients who need additional shock absorption or cushioning. 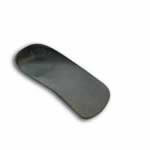 Extra firm posting material added to the distal part of the orthotic shell. Used to stabilise, invert or evert the forefoot. A deep heel cup to give greater stability for severe over-pronators. 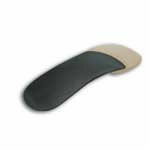 Extra firm posting material added to the distal part of the orthotic shell. Used to stabilise, invert or evert the forefoot. For whole foot pronators. A soft 3mm poron pad placed at the distal end of the orthotic. 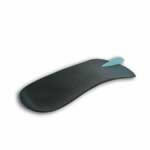 Used for patients who require extra cushioning under the metatarsals. A 3 mm poron pad placed at the distal end of the orthotic and cut away under the specified metatarsal head. This offloads the specified metatarsal and balances the forefoot. Used to accommodate severe corns, calluses and dropped metatarsals. 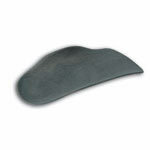 A teardrop shaped pad placed at an interdigital space to spread the specified metatarsal. 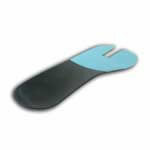 Used for interdigital neuromas and intermetatarsal bursitis if metatarsal pads have not helped.